Manufacturer of a wide range of products which include wet drum magnetic separators, wet high intensity magnetic separator, drawer magnetic separator, magnetic roll separator, magnetic drum separator and liquid line separators. Wet Drum Magnetic Separators is to recover the maximum amount of ferrous by using the intensity of the permanent magnet. Our drum separator is fitted with high-intensity magnets which effectively carry out the separation process. The magnetic separator assembly has fixed magnet inside the rotating drum. When the liquid input is fed into the low-intensity magnetic separator (LIMS) all particles which are ferrous in nature, even the low intensity elements are attracted by a permanent magnet which is placed within the drum and carried along with the rotating drum to be separated from the mainstream. The rest of the liquid with particles showing no attraction to the intensity of the magnet are disposed of out through separate exit point. Wet High-Intensity Magnetic Separator is used for Effective Separation of Magnetically Susceptible particles. Provision exists for Varying the Field Strength. 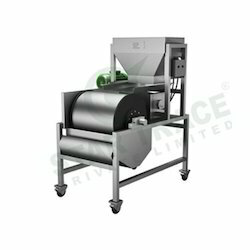 The Canister assembly is provided with the different type of matrix for efficient separation and effective cleaning. Updating Ferrous Metals: Martite, Hematite, Siderite, Chromite, Ilmenite, Manganese, Etc. Separating Non-Ferrous Metals: Wolframite and Quartz, Pyrrhotite and Cassiterite, Wolframite and Cassiterite, Limonite Purifying, Scheelite, Wolframite and Garnet, Etc. Recovering Rare Earth: Tantalum and Niobium, Lepidomelane, Monazite, Etc. Brightening Non-Metals: Quartz, Feldspar, And Kaolin for Ceramics, Sillimanite, Cassiterite, Andalusite, Kyanite for Refractory, and Separating Impurities From Hornblende, Mica, Tourmaline, Garnet, Etc. 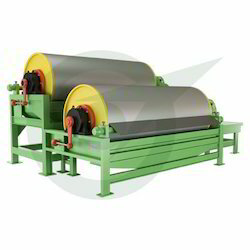 Magnetic Roll Separator are magnetic separation equipment followed by umpteen numbers of industries to separate ferrous from non-ferrous substances. 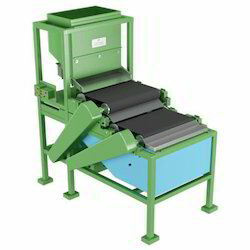 The Magnetic Roll Separator uses powerful rare earth magnets that perfectly segregate feeds; this is made possible by the properties and special series of magnet used. Substances with low magnetic properties are also effectively separated and so there are no chances of missing out even the least magnetically active substance. Magnetic Drum Separator ensures purity of end product, metal extraction that has sale value, preventing other machinery from damage, resulting in magnetic activity. 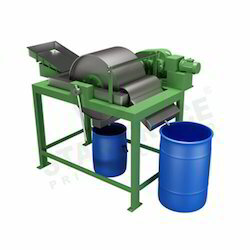 As manufacturers, we design Magnetic Drum Separator along single, double triple drum. Liquid Line Separators are exquisitely designed magnetic separators to remove tramp iron from any liquid stream. During the production process, there are chances that very fine iron particles mix up in the product stream and bring down the quality of the end product. Liquid Line Separators play a vital role and remove the fine contaminants and step up standards. The Liquid Line Magnetic Separators are capable of handling liquids of varying consistencies from water to sauce. No possibility of leakage as the screw arrangement is perfect. The magnetic pulley head has a 360-degree magnetic core, shielded by stainless steel covering made with ss304 an axis for rotation. This is a sturdy structure around permanent magnet which withstands continuous functioning of the Magnetic Pulley. The Magnetic Pulley’s Permanent magnet with strong magnetic field ensures hundred percent success rate. The permanent magnet of Magnetic Pulley can also be replaced by the Flux control magnetic circuit, when impressed by the client or when a requirement arises. 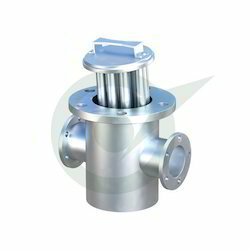 Permanent magnetic pulley head is offered in different widths diameters. Tailor made solutions for permanent magnets are also supplied. The Magnetic Pulley has removable shafts for easy handling, non-removable type available on demand. Rare Earth Neodymium or Strontium Ferrite permanent magnets are available in the Magnetic Pulley. 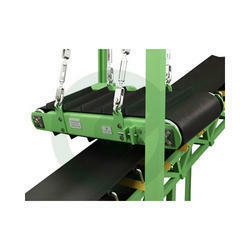 The Magnetic Pulley has Conveyor belt facilitates for smooth flow. Texture specifications suggestions can be taken up. Motors conform necessity will be provided with Magnetic Pulley. Magnetic Coolant Separators is suitable for Cylindrical, Centreless, surface Internal Grinding Machines, Thread Grinders, Honing Machines, Rolling Mills etc. It is also used as a pre-filter along with other types of coolant filters like Paper band or Hydro cyclone filters. The unit can be fitted on existing. 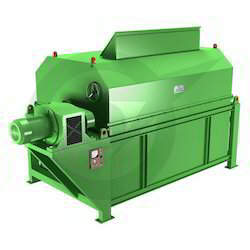 Magnetic Concentrator Separator is extensively used for advancing or concentrating material containing a very high percentage of magnetic or where magnetic/mechanical agitation is required for the separation of many difficult materials. It is perfect for the improving Sponge Iron/Cast Iron borings, Steel/Brass Aluminum Turnings, Chips and for mineral beneficiation application such as the purification of dry ceramic and refractory materials, reclamation of abrasive grains, removal of iron contamination from chemical powders and grains and for many other such applications requiring maximum separation with minimum production loss etc. 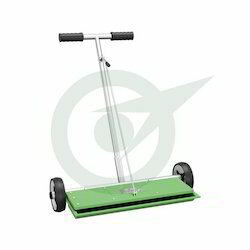 Magnetic Sweeper clears important traffic areas of dangerous scrap iron and reduces the possibility of costly flat tires or personal injury. It can work under different environments except high temperature condition. Simple structure, elegant aesthetic appearance. Easy to operate and easy to maintain, these powerful magnetic tools never need re-magnetizing. The powerful magnetic field functions directory to the floor, can remove ferromagnetic materials completely. Through the adjustment of handle, it can discharge materials faster and more convenient. The Magnetic Hump is Ideal for ferrous tramp metal separation in gravity systems. Star Trace Magnetic Hump separators are adaptable to either round pipe or rectangular chute transfer lines. The Magnetic Hump employs two heavy-duty diverters equipped Spout Magnets positioned so that product flowing through the Magnetic hump is forced into the magnetic fields. The hinged magnets are gaskets and clamped tightly to the Magnetic hump housing for maximum product and dust containment, during the processing operation. The Magnetic Hump swing open for removal of captured tramp metal. The Ruggedly constructed Magnetic Hump is made of stainless steel and with welded flange mounting systems to fit chute or pipe applications. Bullet Magnet is one of the best equipment for inline magnetic separation of ferrous substances present in feeds. The Bullet Magnet has a powerful magnet enclosed in a casing and place in the center of the arrangement. The arrangement of the Bullet Magnet is such that every particle passing through comes in contact with the magnetic field. Ferrous particles of very small size are also trapped and a ferrous contaminant free product is obtained. Made with premium quality Stainless Steel for resistance from corrosion. Bullet Magnet works perfectly with feeds of normal temperature, however, if higher temperatures are to be handled they can be customized. Simple installation of the Bullet Magnet makes it easy to start work without losing out on time. The Bullet Magnet has amazing field intensity that it traps fine ferrous substance as well. Bullet Magnet is available for fixing in horizontal and vertical positions which make it preferable over other separation equipment. Tailor made Bullet Magnet is also supplied. The remarkable usage of Magnetic Plate in industries like sugar, flour, plastic, gravel etc. reflects the level of efficiency with which they perform. The magnetic plate has a simple construction which works to its fullest capacity and holds back irony particles. The face of the magnetic plate which has the maximum magnetic field strength comes into direct contact with the feeds. The deep-reaching magnetic field of the magnetic plate makes sure that every particle in the flow is checked and iron contents retained.Magnetic plates are usually fixed in chutes or below conveyors which assure their effective working. 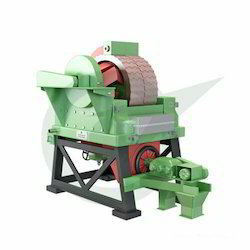 Owing to the expertise of our professionals, we have emerged as the foremost organization of an excellent quality array of Wet Drum Magnetic Separator. 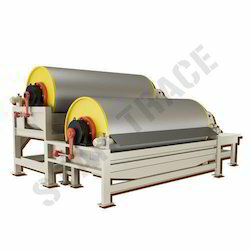 It is almost similar to magnetic drum separator and differs in handling wet inputs. The offered range is manufactured using high grade factor input and advance technology by our skilled professionals. 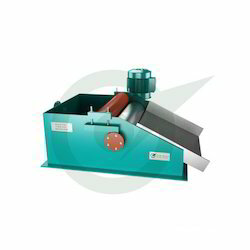 In order to ensure the quality, this separator is stringently tested on various parameters. 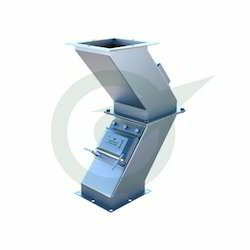 Clients can avail this separator from us in different specifications, as per their needs. 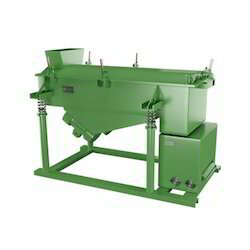 Overband Magnetic Separator is capable of handling huge volumes of feeds that need separation of magnetic substances. The built up of the Overband Magnetic Separator is robust and withstands the rough working conditions under which they perform. 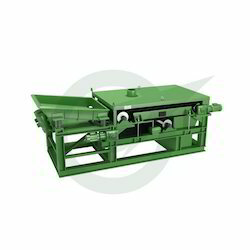 Overband Magnetic Separator is commonly seen in mining plants where they work continuously without downtime. Not only does the Overband Magnetic Separator find use in mining industries but also in many other applications which need removal of iron from the bulk of the material. 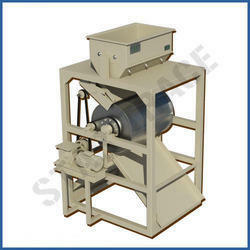 Electro Magnetic Drum Separator consists of a rotating non-magnetic drum containing electromagnet. Magnetic particles are attracted by the magnets, pinned to the drum, conveyed out of the field and discharged while the nonmagnetic particles are discharged unaffected. The magnetic drum is fed at the top vertical center but with appropriate magnet positioning, it can be fed at any convenient point or even front fed or underfed. The use of Grate Magnet has become indispensable when dealing with free flowing dry feeds, for they effectively trap ferrous impurities at the very beginning. 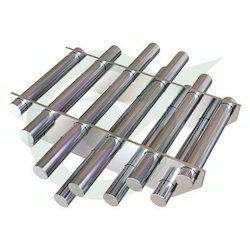 Grate magnets are fixed in hoppers and can be easily maintained without loss of production time. Installation of Grate Magnet is very simple and does not require technical skill. 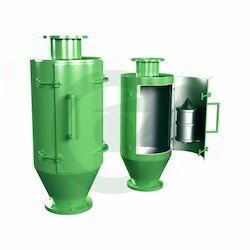 The basic model of Grate magnet is such that it can be just placed at the entry point of feeds which is the hopper. Other models like easy clean and fully automatic are also available which are similar in function but cuts down on cleaning time to speed up the processing line. Cleaning of the Grate Magnet is done manually, lift the Grate magnet from its place carefully and wipe away the ferrous impurities using a thick cotton cloth. It is safe to wear protective gloves while carrying out the cleaning process. Kgs 640 Kgs./Cu.M. 800 Kgs./Cu.M. 960 Kgs./Cu.M. 1120 Kgs./Cu.M.